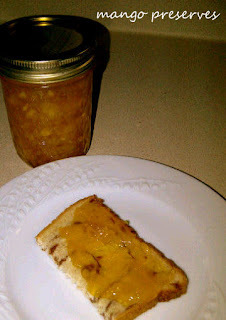 So, there was that half cup or so of kumquat syrup reserved from what was left of the preserves into marmalade debacle. I decided to mix it in with a chopped mango, a cup of sugar, a couple of ounces of lemon juice, and a tablespoon of pectin. I cooked the fruit for a bit longer than I might typically, but only because the mango was not as ripe as I would have liked it to be. The yield was 1 half pint and 2 precious four ounce jars. I processed them in a water bath for about 12 minutes. The end product was still very lemony in color---despite how it shows in the photograph below which was taken with my mobile phone camera. 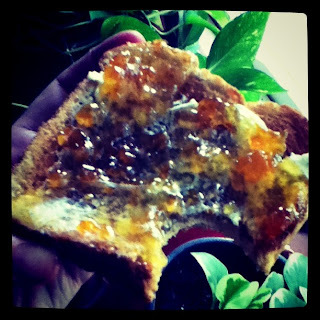 The preserves have a really bright flavor, and that citrus infused syrup really serves it well. next time? we'll go back to big batches with seedless blackberry jam!